Two Injured In Tractor Trailer Crash On North 1-95 | Schuler, Halvorson, Weisser, Zoeller & Overbeck P.A. 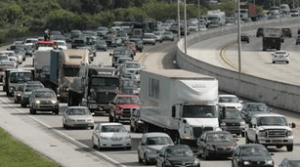 Two people were injured and taken to St. Mary’s Medical Center following the tractor-trailer wreck that blocked part of northbound Interstate 95, the Florida Highway Patrol officials said. The wreck happened when one tractor-trailer ran into another one that was slowing down between Blue Heron and Northlake Boulevard, said a Florida Highway Patrol spokesman. The wreck has blocked three northbound lanes north of Blue Heron Boulevard, the Florida Department of Transportation said. All lanes are now open on northbound Interstate 95. Two people were injured and taken to a nearby hospital for treatment. Further investigations into the cause of the crash are still in place, said a Florida Highway Patrol spokesman. Anyone with additional information concerning the crash is asked to contact the FHP department.